American Superconductor Corporation (NASDAQ: AMSC) and Nexans, the worldwide leader in the cable industry, have successfully tested the world’s first power transmission cable made with second generation (2G) high temperature superconductor (HTS) wire. The cable was produced by Nexans utilizing AMSC’s proprietary 2G HTS wire known as “344 superconductors.” 344 superconductors are AMSC's new 3 ply, 4.4 mm wide second generation HTS wires. This 30-meter-long, transmission-voltage cable was tested at a Nexans high-voltage facility in Hannover, Germany. Operated at 138,000 volts (138kV), the cable contained only 33 hair-thin 344 superconductors, yet it demonstrated the capability to transmit 435 mega-volt-amperes (MVA) of power – enough electricity to power over 250,000 homes. AMSC’s 344 superconductors were designed as a drop-in replacement for customers currently using 1G HTS wire. The 344 superconductors comprise 2G HTS wire clad with ultra-thin strips of copper or stainless steel. 344 superconductors offer significantly higher power density and efficiency compared with similar copper-based wire products. As a result, electrical systems that incorporate HTS wire are dramatically smaller, lighter and more cost effective than comparable systems based on copper wire. The applications for HTS wire include power transmission and distribution cables, propulsion motors and generators, degaussing cable systems, synchronous condensers and fault current limiters. “The ability to carry a large amount of electricity through small corridors is incredibly appealing for urban and metropolitan power grids. Transitioning from first generation to second generation HTS wire proved to be seamless for our cable manufacturing team, and we are very happy with the cable’s performance. Based on these results and the anticipated success of the first generation 138kV HTS cable system we are installing with AMSC in the commercial grid of Long Island Power Authority, we are clearly on a path to finalize development and introduce HTS cables made with 344 superconductors in utility power grids” said Pascal Portevin, Executive Vice President, Strategic Operations for Nexans. The company’s pre-pilot production line began operating in September 2005 and produced and shipped approximately 10,000 meters of 344 Superconductors for customers in the fiscal year ending March 31, 2007. Orders for essentially all of this wire are now in hand. AMSC plans to scale up a pilot manufacturing line with a gross production capacity of approximately 720,000 meters per year by the end of 2007. HTS are materials that can superconduct at higher temperatures than Low Temperature Superconducting materials (LTS). However, even these materials need to be cooled down to at least 125 K to superconduct. AMSC's HTS wires operate below 115 K and nominal operating temperatures range from 20 K to 77K. The second generation (2G) coated conductor HTS wire wire has a different form than the 1G multifilamentary HTS wire that was AMSC'a previous wire product. The superconducting material developed using the coated conductor technology is the YBa2Cu3O7-x material. The wire’s architecture looks similar to a thick film technology. More details of AMSC's 2G HTS wire can be found at their website here. AMSC has suspended production of 1G wire and is now in the process of scaling manufacturing capacity for its 344 and 348 superconductors. The company believes manufacturing costs for this next-generation wire will be up to five times lower than 1G, making it an attractive drop in replacement for customers who have developed applications with first generation wire. Just to clairify, the cable tested by Nexas carried 3150 amps of current. The fundamental limitation of superconductors is the current capacity due to the magnetic fields generated by currents. (If the magnetic field gets too high, the superconducting properties of the cable go away.) The voltage is limited by insulation and other factors that are not fundamental to superconductors. Power capacity is voltage times current. The cable tested is made up of 33 of the ribbons shown in the photograph in the blog article. This means each ribbon carries about 95 amps. The thickness of the ribbon is about 0.2 mm (about 0.008"). 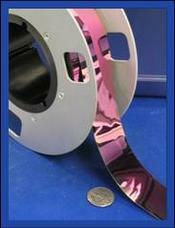 American Superconductor states that their ribbon can carry about 150 times the current of copper on a volume basis. However, additional volume is necessary to keep the ribbon immersed in liquid nitrogen to keep it superconducting. I don't know that much about this to even comment. Is this the kind of thing that would help get energy from the desert to the city, or from ocean wave/air turbines to the city? It sounds like a great breakthrough if it can be used to transmit energy at any distance. The market for these kinds of cables is volume-limited underground transmission, particularly under cities. Heat dissipation is also often a limit in those situations. The superconducting system will actually slightly cool the tunnels in which the cables are placed, if the refrigeration system is elsewhere. "Is this the kind of thing that would help get energy from the desert to the city, or from ocean wave/air turbines to the city? It sounds like a great breakthrough if it can be used to transmit energy at any distance." The problem is that the cable needs to be cooled to liquid nitrogen temperature for its whole length. This calls for a heat-insulated enclosure plus refrigeration equipment. In addition, the wire requires high voltage insulation its whole length so it doesn't arc to the heat insulation enclosure. I suspect that this cost more than the cable. With copper, air is the high voltage insulation and the cooling, with high voltage insulators only at the support towers. No refrigeration equipment required. Last I checked, underwater is pretty cold. 720,000 meters per year is not going to rewire the network anytime soon. That's only 720KM, which is a drop in the bucket compared to the size of the network. I think the major uses at this scale will mostly be more efficient motors(industrial and for ships), magnets, transformers and various at the source components in the electrical system. These will make some important improvements but they are not going to string up this stuff in local hydro corridors any time soon so worries about how to plumb it are not so important right now. I wish they would publish how much silver they use per KM of cable. This product if scaled up has the potential to really tighten up the market. Silver anylst predict this type of product has the potential to consume 50 million oz a year. Silver is already in deficit supply and we've been eating into above grounds stocks for nearly 2 decades reducing supply from 2 billion ounces to an estimate of 300m ounces. Bullish for silver but it could cause cost or production problems for this product long term. It is plenty of production to make a huge amount of superconducting energy storage capacity. This technology is ready anytime renewable energy needs backup now. The 500 KVDC grid could use this kind of storage to backup the whole country. So, the ambient cooling (or, anyway, lack of heating) that superconducting cables would produce would be no advantage there. How would they store energy in the cables, can you just jam electrons in and let them circle or something? Big loop, energy is stored inductively in the magnetic field (1/2 L I^2). The local utility here is the first to use SMES on a grid. To cushion the load when paper mills demand a lot of power very quickly. It saves a lot of fuel by cutting the need for spinning reserve. Presently, the kind of "storage" superconducting loops are economical for is to maintain stability on timescales of seconds, when load changes suddenly (for example, when an industrial consumer turns a really big motor on). In this application, its strength over other forms of storage is that it can begin to discharge on immediate notice, which pumped storage cannot. For hours of storage, however, for example for day-night load balancing, the superconducting loop is not cost-effective against pumped storage. what? the world's first transmission cable? I will look forward for this one, its a quite advance in technology. wonderful post! keep it going. this new invented super conductor cable is very interesting,its capacity to save energy could reduce our electric bills...I think several people will be interested in this kind of transmission cable.So impressive post! Pleasant to read this blog and so much information that you have shared with us. This will be a great resource for us. We are lucky we find your site and read your articles. Once again, thank you so much.